You want to learn about geography, culture and history of Vietnam? You want to visit many famous places of Vietnam? You are a student who feel that geography is very dry and bored subject? Or you simply want to relax in your free time? 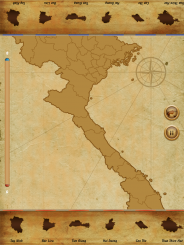 Let’s “play and learn” with MapPieces: VN – a educational games that help you learn about geography, history and culture of Vietnam. 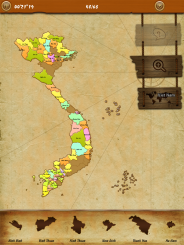 With stunning visuals and accurate information, this game will help you to improve your knowledge about geography of Vietnam that you do not need wasting time to research by utilizing your free time. The game is designed to be simple and very exciting for players. It not only helps you relax during your free time but also provides you much useful knowledge of geography and history of Vietnam. With MapPieces: VN, geography learning of the students will be more interesting and they will not be too preoccupied about geography exams in their school anymore. – Let prove that you have a good knowing about geography of Vietnam through “Leaderboard” which manages your score ranking. It also help you share your score as well as your achievement items on Facebook and Twitter. 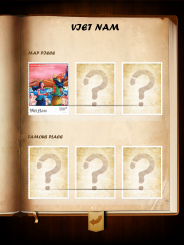 – Through your achievements you can become a philately expert through “Collection” in the game. With the collection of a full “Việt Nam” stamps set, you will also learn about the history of “founding and defending Vietnam country”. 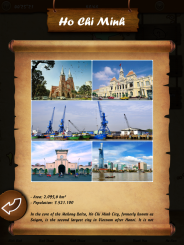 – Once you master the “Map Pieces” mode, please try the advanced mode – “Famous Places”. You will be going into each area to play and learn about the famous places there. With this mode, you just sit on the spot that seem to travel and visit the scenic spots all over Vietnam. – Your don’t know to put a map piece into the proper position? Don’t worry!!! This game also gives you “a hand”(hint). This feature will help you locate your map piece. But remember that you will be added 30 seconds each time using it. – Support 2 languages : English and Vietnamese. 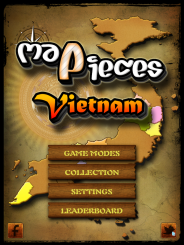 Have fun with MapPieces: VN!! !